Waterfront Bar And Grill Overlooking Grand Lake, Oklahoma Serving Fabulous Food With Amazing Views. Accessible By Land Or Grand. Looking for great food and Grand Views? Morrow's Bar and Grill offers both fabulous food options and Grand Views with a large patio overlooking beautiful Grand Lake O' The Cherokees. From our tasty flame broiled burgers to our signature beef Shish Ka-BOB entree, our menu offers a wide range of mouth watering options that are sure to delight any palate for lunch or dinner including: Appetizers like our Fried Mushrooms, Fried Pickles, Hummus with Parsnip Fries, Pretzel Sticks with Cheese Dip, Wings, Chips and Salsa, or for those guest that are undecided try our Sampler platter with a combination of any three items. Looking for something lighter? We offer Chef, Shrimp or Chicken Salad with Ranch, Chunky Blue Cheese or Balsamic Dressing. And that's just the beginning... we offer tasty sandwiches, flame broiled burgers, a large array of entrees and pasta. Bring the kids too. We offer a kids menu with their taste buds in mind. Selections include Homemade Mac and cheese, Chicken Chunks, Grilled Cheese, Cheeseburgers, and Spaghetti. Have a sweet tooth? We have that covered with some amazing and fresh selections. Try our Peach Cobbler, Cheesecake, Gelato with Carmel Texas Pecans, Texas sheet cake or Wedding cake with raspberry sauce. We also have Vanilla Ice cream that you can top with whipped cream, chocolate or Carmel... go ahead try them all! We now offer a full bar with an expanded high point beer menu, liquor and mixed drinks. 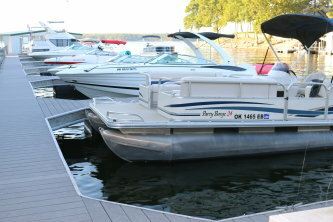 We are easily accessible by water in Rapier Hollow on beautiful Grand Lake, OK. and offer our guest courtesy slips that are well maintained in various sizes to accommodate most any size boat large or small. If you are joining us by land we are conveniently located just 2 miles from the famous Pensacola Dam and offer a lower lever and upper level parking area for our guest to insure easy access regardless of the vehicle you are driving. Lower level parking offers easy accessibility and level paved walking areas for our guest. If you are a sports fan, we are your Grand Lake destination! With 12 Large TVs inside and out on the Patio we will broadcast every Monday Night Football Game, Oklahoma State Cowboys Game and Every Oklahoma University Sooners Game. Have a special request? Let us know. We offer indoor and outdoor seating, and would love to have you join us. We can accommodate small or large group outings.